Much like humans, animals are susceptible to having the occasional bad day. Of course, instead of feeling beaten down by, say, missing their train or being splashed by a giant puddle, it might be because they were chased by a deer, or surrounded by a pack of hyenas, or accidentally shot their owners. 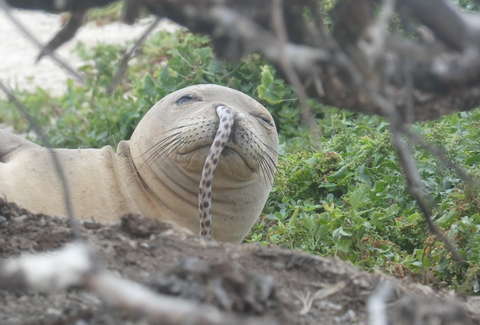 Though it could also be because they ended up with an eel stuck up their nose, like this poor Hawaiian monk seal did. The photo of the young seal, which was posted on Facebook by the Hawaiian Monk Seal Research Program earlier this week, illustrates what is evidently an increasing issue for the endangered species: eels in noses, per a report from Atlas Obscura. According to the researchers, there's been a recent surge in "eel in nose" situations in the habitats they monitor throughout French Frigate Shoals in the northernmost parts of Hawaii, and no one knows exactly why it's happening. "In the nearly 40 years that we have been working to monitor and protect endangered Hawaiian monk seals, we have only started seeing 'eels in noses' in the last few years," reads a blog entry posted by the HMSRP. "Yet, our researchers have observed this phenomenon three or four times now. We don't know if this is just some strange statistical anomaly or something we will see more of in the future." So, what the heck is going on? Well, one theory is that since Hawaiian monk eels forage into sand, rock, and coral crevasses looking for food, the eels slither up their noses in an effort to defend themselves. Another hypothesis is that after eating the eels, the seals involuntary regurgitate them through their noses. Either way, it must be incredibly uncomfortable for both creatures. Fortunately for the seal involved in this incident, a response team intervened and "gently" removed the eel from its nose giving it a "slow steady pull." However, things didn't go so well for the eel, which died during the procedure. It's unclear exactly how long this one was, but they've excavated eels as long as two freaking feet long from the noses of other seals, according to at least one earlier Facebook post. So just remember, next time you're having a case of the Mondays, know it could be much, much worse.